The Big Four area lies along the South Fork Stillaguamish River east of Granite Falls. The trailhead is located at the site of the former Big Four Inn, which burned down in 1949. There is nothing left except the fireplace, which is located in the picnic area that has spectacular views of Big Four Mountain and Hall Peak. 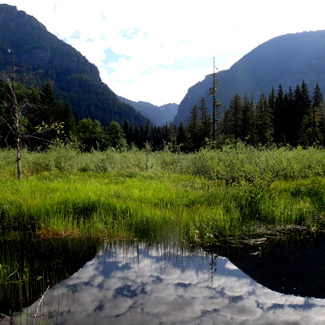 The one-mile trail to the Big Four ice caves takes you on a boardwalk across a freshwater marsh, across a bridge over the South Fork of the Stillaguamish River, into the predominately silver fir forest, and eventually to a huge cirque that ends at a lookout area. The alpine wildflowers that are present here would normally be encountered at elevations of 4,000 feet or more, although the elevation is actually only 1,700 feet. With its diverse habitat, the Big Four area is one of the best bird-watching locales in the North Cascades. The trail is unique because it allows the bird-watcher/hiker to pass almost effortlessly from lowland marsh, meadow, and river habitats through classic Canadian and Hudsonian forests, into the bleak Arctic-Alpine Zone. The birding is exceptional in June; expect to see a variety of birds in the picnic and marsh area, including Red-breasted Sapsuckers, Vaux's Swifts, Willow Flycatchers, Common Yellowthroats, Yellow Warblers, and Warbling Vireos. Look for American Dippers, Common Mergansers, Harlequin Ducks, and Spotted Sandpipers on the river. Winter Wrens, Brown Creepers, Western Wood-Pewees, and Varied Thrushes are common in the forest. From I-5 north, exit #194. Take Route 2 east for two miles. Follow Route 204 northeast to Lake Stevens and head north on Route 9. Go 1.7 miles and turn right (east) on Route 92 toward Granite Falls. Cross through town and take a left on the Mountain Loop Highway. Go 14.5 miles to the Big Four picnic area trailhead on the right. The trail can be reached May through December (depending on snow level). A Northwest Forest Pass is required for parking at the trailhead. There is a restroom, and part of the trail is handicapped-accessible. Because of the popularity of this trail, it is best to go on a weekday. Warning: The ice caves are very dangerous. Avalanches are a constant threat in winter and early spring. The ice caves are exceptionally dangerous to enter or climb on.